and other procedures in Dunedin, FL. Hopkins General Dentistry is proud to offer laser treatment for periodontal disease in Dunedin FL. By using The Gemini 810 + 980 diode laser, all the advantages and uses of laser dentistry are available to patients. 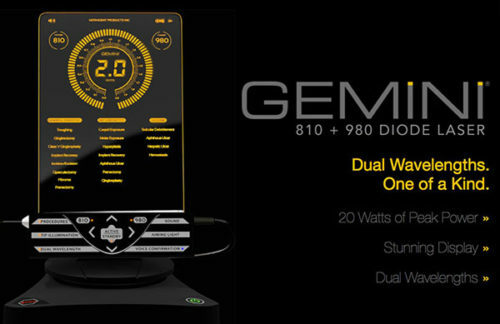 The Gemini is the first dual-wavelength soft tissue diode laser available in the United States. The unique dual wavelength technology combines the optimal melanin absorption of an 810 nanometer wavelength laser with the optimal water absorption of a 980 nanometer wavelength laser. Dr. Mike Hopkins received his Associate Fellowship Certification from the World Clinical Laser Institute. Laser procedures are more precise. Reduces symptoms and healing times. Reduces, pain, bleeding, and swelling. Reduces the amount of bacteria in both diseased gum tissue and in tooth cavities. Anesthesia is less likely to be needed. 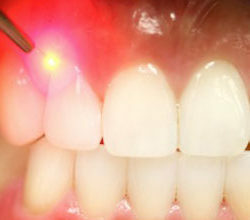 To view brochures about laser treatment for periodontal disease click on the links below.